British inventor Contra Vision has provided an ‘infusion solution’ to those offering, serving and enjoying tea with his latest creation, the Teapy. The Teapy enables the brewing of tea to be curtailed at the desired strength for individual taste and avoids drips, rather than the traditional method where tea is left continuously infusing often making it too weak or too strong. It involves a precision shaped and fitted lid designed to sit on top of a mug or cup, keeping the water hot before and inserting the tea bag. It has a scalloped ‘perimeter recess’, which creates an aperture inside the mug rim to retain the tea bag string and prevent the tag slipping into the hot water. 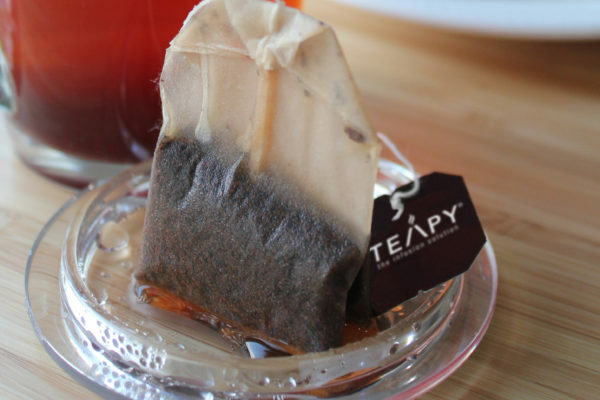 A transparent Teapy enables the customer to keep an eye on and obtain their preferred strength of tea. Teapy is then lifted off the mug, turned over and placed on the table, the perimeter recess ‘docking’ snugly against the side of the mug, enabling a drip free transfer of the used tea bag onto the adjacent Teapy. This prevents mess, ensuring that the tablecloth or table top remains clean for the next customer. Recently there has been a steady growth in the sales of fine tea, as consumers enjoy the artisanal offer of specialist providers. Retaining the aromas under the Teapy while steeping the tea, and releasing these aromas upon lifting, is an additional benefit appreciated by tea connoisseurs, that neither a teapot nor an open mug can offer.